I enjoyed writing the last Christmas Memories blog so much that I decided to continue the thread. I requested that all our team submit their holiday memories. So here they are. Each memory is very different and very special. Enjoy and hope these holiday memories bring to mind some of yours. It was Christmas Eve and I was twelve. I was desperate for a puppy, and wouldn’t it be wonderful if I got one for Christmas? That’s all I wanted. Mom and Dad were not encouraging, saying that puppies arrived on their own schedule and not likely in time for Christmas. I should be patient and perhaps in due time I could have one. We were waiting for the arrival of dear family friends, “Aunt” Peg and “Uncle” Guy, who always celebrated Christmas Eve with us. But before their arrival I had one thing I wanted to do. I had made a wreath from greens I had gathered in the woods, and I wanted to give it to Chuck who lived across the street. He and his family were also close friends, and this year was a sad one for them. “Uncle” Chuck was bed ridden and dying from cancer. I hoped my visit and the wreath would cheer him up a bit. Chuck always put on a brave smile for me, and this time was no different as he asked me what I wanted for Christmas. I said I was hoping for a puppy but had pretty much given up on that idea. Chuck’s response was similar to my folks’, adding that we don’t always get everything we want . After our visit I returned home to find that Peg and Guy had arrived. But what grabbed my immediate attention was the adorable little dachshund puppy nestled in the stocking I had hung on the mantle. Words cannot describe my joy! And how did all this happen? It seems that everyone was in on the surprise, including Chuck and also Peg and Guy who had been keeping the puppy until time for the big surprise. Even my Uncle Bob knew about it, and had made a beautiful bed for Ginger out of pine boards. I felt pretty lucky that all these people had cared so much. Ginger became my loyal best friend, and celebrated many Christmases with us. Sadly, that was Chuck’s last Christmas. I will always be grateful for his friendship and the chance to spend that Christmas with him. The memory of that bitter sweet Christmas will be with me forever. 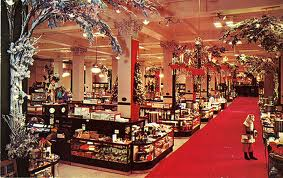 DC’s grand department store, Woodward & Lothrop (Woodies) flagship store had Christmas window displays that along with many, we’d go see for the Christmas decorations (despite that we are Jewish and celebrate Chanukah!). There was a “Secret Santa” shop in the store (which I think they started in the mid-60s) with a two way mirror which allowed parents to watch their kids shop inside the store alone, while they chose gifts for their families (I don’t recall how the payment took place but we paid with a few dollars and I gather the parents paid the balance later!). The shop was decorated and I think I recall a live Santa as well. I remember shopping in the store when my brother and I were probably 3 and 7 or so! Some fun memories for us as a family to celebrate Chanukah, at Christmas time! We did pick out our gifts for Chanukah there! One of my Christmas memories…and there are many, especially going back to my family when I was a kid…was when I was in the Army stationed in what was then West Germany. I could not afford to fly home for the holidays and spent the holiday in Viernheim, near Mannheim. The USO, however, delivered boxes of cookies to the troops at our kaserne. My gift box was filled with Spritz cookies…those kind we used to make with my Mom using one of those press-thingies. Decorated with colored sugars and those small silver balls that nearly broke your teeth when you crunched them. To this day I support the USO annually for bringing a childhood memory from home to this soldier. Every Christmas Eve until I was around twelve my Mom & Dad and three older sisters would have dinner with my maternal grandparents, Ammie and Umpie. It was quite a formal affair with jacket and tie, passed hors d’oeuvres and sitting up straight for what seemed longer than necessary. Dinner was roast beef, carved at the table with much ceremony. My grandparents were well into their 70’s then, prone to common maladies of that age and just pretty darn “nonsensical” at times. This was most evident during the after-dinner festivities, which centered around a game of bingo. After dessert, while still seated at the dining room table, my grandmother would pass out the bingo cards, display all the wonderful gifts to be awarded the winners, and place the “bird-cage” in front of her. This “bird-cage” was a round cage which you could turn with a handle. Inside the cage were numbered wooden balls. 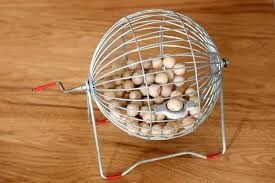 If you turned the cage slowly (key word slowly) a ball would nestle itself in a little cup which could then be plucked out and read to the awaiting bingo contestants. Ammie would ceremoniously work the contraption properly for the first two numbers – and then – pandemonium! She would start to crank the “bird-cage” at high speed until the little cup catapulted one of the numbered balls into the room at high speed. The assembled group would feverishly scramble to find the projectile and read off the number, amidst howls of laughter. However, the ever increasing speed with which Ammie spun the cage and the resulting onslaught of little numbered balls sailing all over the room made it impossible to continue the game due to the cry to STOP so that we could regain or breath from laughing so hard. The game would then resume and the whole process repeated until Ammie would halt the proceedings and hand out a gift to each of us. This happened every year, mind you, with the same outcome. Yet we looked forward to it with the same excitement and enthusiasm – it was Christmas Eve with the grandparents after all. The first memory pertains to my Christmas stocking. 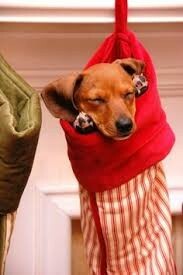 This stocking has always been the one I have used, from my earliest days as a child to today. We always received an orange and a coin in our stockings, because my mother would tell us how during the Depression, they always got a dime and an orange in their stockings, and it was truly a big deal for them. My Dad was a coin collector, so the coin was usually something collectable (and yes, I did spend my coin on a bracelet at Woolworths and baby doll clothes, something I truly regret to this day!). Well, the year my twin sister and I were in 6th grade, we both got a twenty dollar bill in our stocking and thought that was a fortune! The twenty was actually used for a school field trip to Williamsburg VA for 2 nights (such a deal!). I can remember the trip to this day, but most of all I remember my stocking and how it has endured over the years (even though one year Scott hung it too low for our dog Arthur, filled with chocolate- you get the picture!). Dapper Dan-better than any ‘ol fire truck! The second is when our son, Christian was young. This is a picture of whom we call “Baby Dan”. My family would gather every Christmas around 2 pm (all of our Holiday gatherings are at 2, just because), and when our children were young would exchange gifts. One year, when Chris was just two, he received a toy fire truck from my sister, while my nephew received a doll called Dapper Dan that would teach you to tie shoes, button and snap clothes. Well, while we were all chatting away, Chris apparently eyed up Dan and manipulated an exchange right there- fire truck for Baby Dan. Dan became Chris’ best bud and that doll has traveled the world with us. He has become a bit worn, the jacket is gone, his eyes were replaced, along with his nose, and his ties for the shoes were removed. 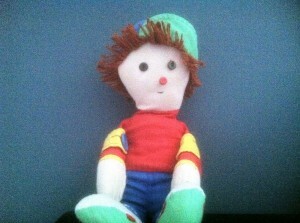 But Dan remains a part of our family, now hanging in our room set for the grandchildren. Both items are symbols of simple times gone by, family missed and memories endured. One of my special Christmas memories goes back to December 1958! My parents and I were on an eastern Christmas trip from California with family visits in Chicago and Boston. Along our travels, we spent a couple of days in NYC, how perfect during the Holidays! My Dad had business appointments one day so Mother and I went to Rockefeller Plaza to see the Christmas Show at Radio City Music Hall. Yes, with the Rockettes! 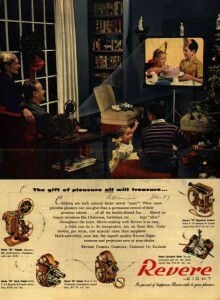 Back then, you not only saw the Christmas stage show but also a movie! The wonderful movie Auntie Mame premiered in NYC prior to Christmas as part of the Radio City Christmas program. Not sure when the movie was later released on VHS, then DVD and now streaming, but ever since then, there hasn’t been a Christmas where I haven’t spent one glorious evening watching one of my all-time favorite feel good movies. The sharing of this movie continues on to this day! Roz Russell was the perfect Auntie Mame, and for all Auntie Mame’s eccentricities, it was her ability to express her love for her family and friends that was so special. The connection has been made all the stronger because I see in my mind’s eye, my Mother, both physically and emotionally as Auntie (Roz Russell) Mame. Sometimes great memories only get stronger and better……….I love it! There are so many transformative, deeply meaningful Christmas memories. Mine, however, are unremarkable, so I have learned to borrow memories to make my Christmases snowier, merrier and inspired. Every December I go to the garage and retrieve the “Christmas box” where stockings, stars, tiny trees, gnomes and lights are stored. At the bottom are the books – favorite Christmas stories that kindle the spirits. How The Grinch Stole Christmas by Dr. Seuss. The Grinch has an epiphany and is transformed from a hater to a lover by joyful Cindy Lou Who and the citizens of Whoville. Brave Irene by William Steig. Irene braves a blizzard to deliver a ball gown to the duchess, on behalf of her ill mother. She prevails, is rewarded for her bravery and returns home with delicious food. Babar And Father Christmas by Jean De Brunhoff. The King of the Elephants sets off on behalf of his children, to find Father Christmas (in Bohemia) and convince him to come to the land of the elephants. A Child’s Christmas In Wales by Dylan Thomas. This is the one we read aloud by the fire, passing it from person to person. The author recounts delightful episodes of an imaginary Christmas day in Wales in the 1920’s. 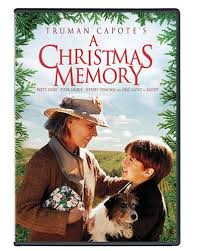 A Christmas Memory by Truman Capote. The story of the last Christmas seven-year-old Buddy spent with an elderly cousin, making fruitcakes for friends and “persons we’ve met maybe once, perhaps not at all”. Nostalgic, uplifting, heartbreaking and beautiful. Because both sets of my grandparents lived in our hometown, we would alternate visits Christmas Eve and Christmas day. When I was very little, we weren’t invited to the evening gathering at my mother’s mother’s house (“Goggie”), so we’d have a quiet dinner with my dad’s folks (“Grammy” and “Grampa”) at our house (no cousins, so a small gathering). But the affairs at Goggie’s, when I was old enough to be there, were both formal and kind of off kilter. Aunts and uncles and cousins from all over were all there. Once a year Goggie broke out the caviar, which I thought was pretty disgusting. And when we finally made it to the huge table for the meal, it was an endless chore to get through the courses, as my Uncle Frank made movies of the entire event. “Frank, sit down and eat!” “Frank, everyone is waiting on you.” “Frank, can Sykes carve now?” “Frank….” You get the idea. I’m sure the tapes are all somewhere, though I’ve never seen one. Oh, and were all wearing those paper hats that came out of those snapper thingies that had plastic toys inside. At the end of the meal everyone would read funny poems they had written about someone in the family, accompanied by a gag gift. These were hysterical and made it hard to get through dessert! But it was family. And family is still what Christmas is all about to me. Nothing is more important than the love that cannot be shaken nor forgotten. Merry Christmas! Thanks to The B&B Team for sharing. Hope you all enjoyed the read. I certainly enjoyed putting it all together. This entry was posted on Monday, December 15th, 2014 at 4:45 pm	and is filed under Uncategorized. You can follow any responses to this entry through the RSS 2.0 feed. Both comments and pings are currently closed. Wow, what a great blog. And a point of proof is that this blog stirred memories of my own Christmas past that I thought were lost. Happy Holidays to you all!